In recognition of his leadership in the pursuit of excellence in dressage in the United States. 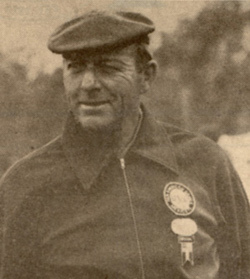 As USET coach, Col. Bengt Ljungquist guided the US dressage team to a bronze medal at the 1976 Olympics and a gold medal at the 1975 Pan American Games. He established an outstanding system of judge training that continues today. Col. Ljungquist's instruction of dressage at all levels laid the foundation for many of America's most successful riders. Colonel Bengt Ljungquist devoted a decade to furthering dressage in the United States. He developed a judges' training program that continues today and conducted the first organized forums, which gathered together the day's most learned trainers and aspiring judges. His dedication to and leadership in the pursuit of excellence in dressage in the U.S. was recognized by his induction into the USDF Hall of Fame in 1998. Born into a Swedish military family in Sweden, Ljungquist continued the family tradition by joining the Swedish Army after he completed secondary school. In 1934 he received his cavalry commission, which he later resigned, along with many of his brethren officers, during the Finnish-Soviet Winter War to join the Finns and defend their country. After the Finnish Soviet Winter War (1939-1940) he returned to Sweden and its army, where he studied and had a tour of duty as an instructor at the Military Academy at Karlberg. Ljungquist's military career included being sent to Ethiopia as part of the Swedish Military Mission to help establish a cadet school and to train Imperial Guards. He was also commander of the Swedish cavalry cadet school. In 1955, he was promoted to commander of the Royal Horse Guards and stationed in Stockholm. As part of his military duties, Ljungquist organized the equestrian competition at the 1956 Stockholm Olympic Games. An avid lifelong equestrian, Ljungquist began riding at the age of ten. An active national and international dressage competitor throughout his military career, he won the Swedish Dressage Championship six times. He was the team reserve rider for the 1960 Rome Games and represented his country at the 1964 Tokyo Olympics, aboard Karat. was even more famous in international circles as a fencer than as an equestrian. He was a reserve world fencing champion who competed on several Swedish Olympic fencing teams. When the cavalry was mechanized, Ljungquist began a career as a civilian dressage trainer and instructor. During a visit with his sister at the 1968 Mexico City Olympics, he made a trip to the U.S. that sparked his interest in furthering dressage in the States. In 1969, he was invited to teach dressage at the Foxcroft School in Virginia. On that same trip, he gave a clinic at Lake Erie (OH) College Equestrian Center. That involvement led to other lessons and clinics, and 1978-9, he began training out of future "O" judge Linda Zang's Idlewilde Farm in Davidsonville, MD also visiting Meredith Manor in West Virginia. Numerous notable dressage riders made the trip to Idlewilde to study with Ljungquist, who later became the U.S. dressage-team coach, a position he held from 1974 to 1978. In 1974, he brought the U.S. squad to the attention of the European dressage community when he coached World Championships competitors Elizabeth Lewis on Ludmilla, Edith Master on Dahlwitz, John Winnett on Leopardi, and Sidley Payne on Felix. Then in 1975, the U.S. team returned home from the Pan-American Games in Mexico with a team gold medal, as well as an individual silver for Hilda Gurney and Keen, an individual bronze for Dorothy Morkis and Monaco, and a fourth-place individual finish for John Winnett and Leopardi placed fourth. To cap off his international coaching accomplishments, Ljungquist guided the U.S. dressage squad to a team bronze medal at the 1976 Montreal Olympic Games. An advocate for dressage-judge education, Ljungquist helped to develop a training program for the Potomac Valley Dressage Association. The PVDA program became the model for most judges' training programs in the U.S. In 1976 Ljungquist published his Practical Dressage Manual, which today remains a modern equestrian classic.